SEO Effect > Blog EN > SEO Effect updates > Update: track your competitor’s subdomain rankings too! Always wanted to know how your competitors use subdomains in their SEO strategy? Not one of life more important questions, but in a competitive online niche this can be important! In SEO Effect you can now see how their subdomains are ranking in in the updated ‘SEO visibility index for competition‘ report.If (!) 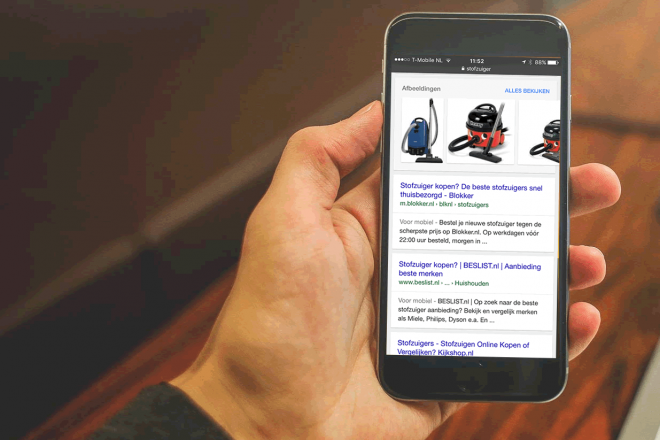 you have entered your competitors websites in the settings of your campaign, SEO Effect now also tracks if a subdomain scores in the SERPS (or rankings). And the good thing is, you don’t have to do anything to make that happen. Where ‘support is the subdomain, ‘google’ the domain name en .com is de domain extension. You can use any frase as a domain name and, just like with folders, use sub-sub or even sub-sub-sub domains. 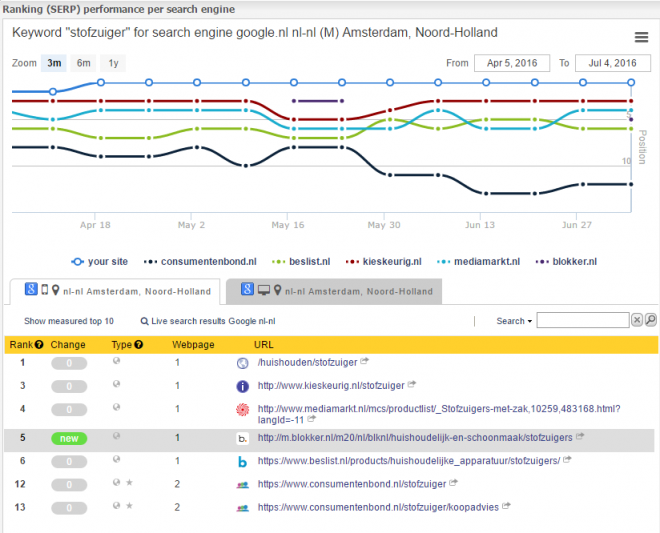 Another example is the Dutch website blokker.nl that has its mobile rankings scoring with a separate subdomain ‘m’. 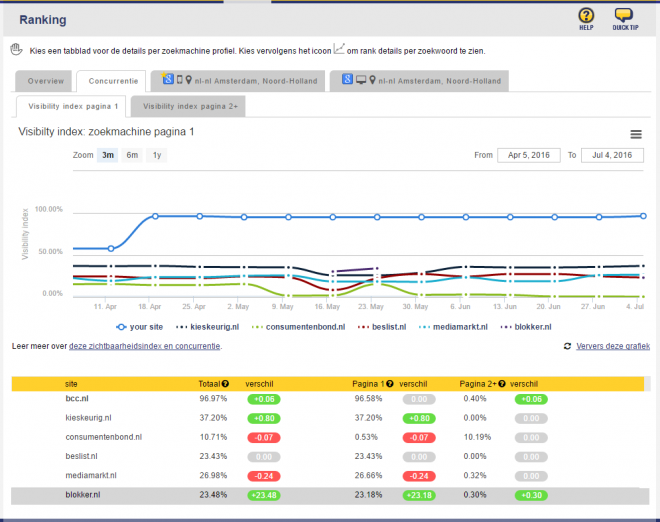 With the latest update of our rank tracker we now also measure your competitors subdomains. To go back to the Blokker example (they sell household supplies and small appliances). As a competitor you would fill in “blokker.nl” so without any subdomain, just as the instructions said. Up to now we used to only measure the ‘www’ and the www-less variants werden (so: http://www.blokker.nl and http://blokker.nl) so you would miss out any rankings from their mobile website. That has been improved so now any subdomain is measured, including htttps://m.blokker.nl. 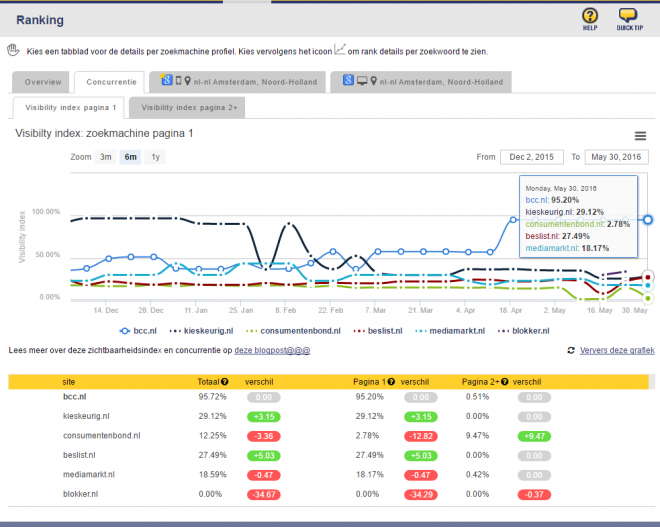 The visibility index for a test site including Blokker showed a serious dip when they switched from www naar m.blokker.nl voor mobiele rankings. (Note that we’re tracking for mobile rankings in this case.) And so they more or less disappeared form our radar. The index score collapsed from 34,67% to 0%. and now its like this: m.blokker.nl has been added in the index which is now at 23,48% for that site. 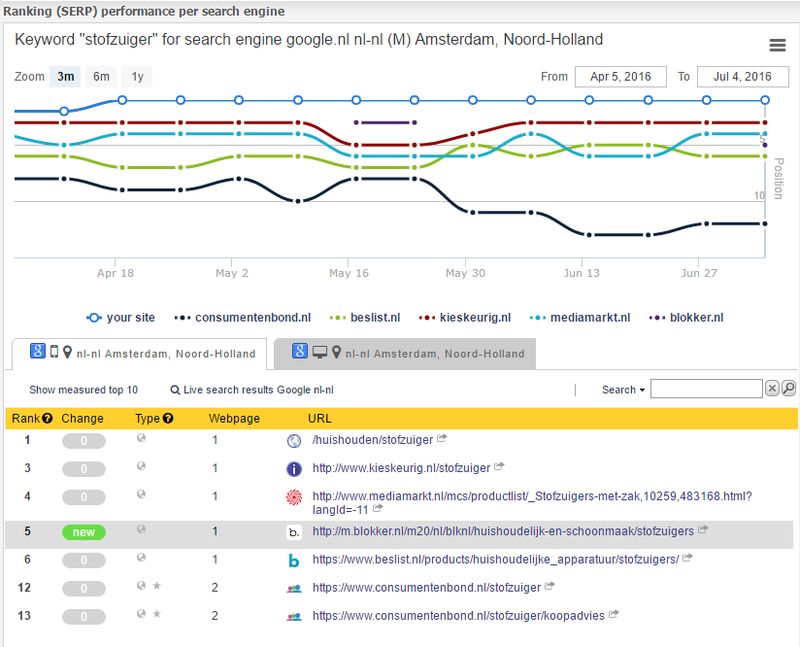 Which is also shown in the SERPS where m.blokker is being detected as shown below. This will give you a much better idea of what is going on with your competitors. Handy! Note that this might cause a spike in your next (or most recent) rank update showing a higher visibility score for your competitors if they were using subdomains. We’re measuring them on Memberzone since 7 juli 2016. If so, check if SEO Effect has found one or more subdomains. For your own campaign, subdomains — other than with www of www-less — are not measured in the rankings. If you want to measure a subdomain, you need to make a separate campaign for that.